Installed in May of 2012, the Temple Emanu-El solar array produces around 30,500 kWh each month, enough to power 87-94% of the site's electrical consumption. The 630 panels sit on two custom steel structures that shade most of the north parking lot. Temple Emanu-El had been looking for a shade solution for their parking lot, and when the option to go solar and have shaded parking came around, they were very excited. The biggest barrier to going solar for Temple Emanu-El was the perceived cost. After learning about TFS's financing options for non-profits, they found that they could see immediate savings on their electric bill with no out-of-pocket cost. Over the next 20 years, their system will save over $500,000, which they can then direct back into their ministry. For Temple Emanu-El the environmental savings provided by the solar panels are an added bonus to the shade and financial savings. In describing their commitment to the environment, Temple Emanu-El found this passage from Ecclesiastes/Kohelet 1:4 applicable, " ... the Earth remains forever." Ascension Lutheran Church and School installed a solar parking shade structure at their north Tucson campus in April of 2013. The 147.84 kW solar system provides 85-90% of the electricity used on site while shading 35 parking spaces. Ascension Lutheran believes that there is a "need for alternative forms of energy because of rising electricity costs in the future." For them, going solar was a way to help protect themselves against these rising costs while "being good stewards of God's creation". Their Parish Administrator also remarked that "Solar is exciting and empowering." St. Francis-in-the-Valley Episcopal Church turned on their solar electric system at the end of March in 2012. Their 59.22 kW system offers them financial savings and also allows them to fulfill their "Biblical responsibility to protect our God given earth and environment," says Carl Perry, a St. Francis parishioner and one of the main driving forces behind the church's switch to solar. The process for St. Francis in the Valley started on Earth Day in 2010, when Perry attended a Solar Seminar held by the Interfaith Council of Green Valley. There he learned that with a third party investor a solar system for St. Francis would be economically feasible. Now, the solar system covers 95 - 99% of the electricity needs for the church, and they will see over $113,000 in savings in the next twenty years. When asked about St. Francis' sustainability goals Perry says, "Solar has planted a seed that I hope grows." Christ Presbyterian Church, which has been serving their community since 1956, has recently decided to power their place of worship using the sun. The decision to make the switch to solar was made primarily to confirm their dedication towards being stewards of the earth. Pastor Steve Melde says, “We saw it as a stewardship issue: not only investing in the future costs of electricity, but providing for a cleaner environment and taking care of God’s creation.” Their solar system was completed at the end of 2012, and consists of 315 SunPower solar modules atop a custom-made steel structure that doubles as shade for 32 parking spaces. The system will provide between 92-100% of Christ Presbyterian's electrical needs. Finished in late 2012, the New Armory Building on Congress just west of downtown Tucson provides new, affordable housing for seniors, aged 62 and older on restricted incomes. The building houses 143 modern apartments and will meet LEED for Neighborhood Development standards at the LEED Silver level, helped by their solar panels. Residents will be able to use the new light rail, which will pass in front of New Armory on Congress. They also have easy access to the Santa Cruz River walk and bike path, as well as the Mercado San Augustin, which has multiple community events each month, including a Farmer's Market. The New Armory Building has a 126.9kW system, which provides the apartments with a monthly estimated production of 19,164kWh. On the roof, 412 modules are supported on shade structures over the many air conditioners required to cool the building. The monthly environmental savings are also significant; each month the solar electricity offsets over 19,000 lbs of Coal from being burned and prevents 42,690lbs of CO2 from being released into the atmosphere. The National Outdoor Leadership School (NOLS) has long been dedicated to sustainable practices and maintaining their natural environment. In light of this, they commissioned TFS to install a 19.7 kW system for the school which will cover almost all of their electricity usage. The system will also become part of their teaching material to students and visitors about sustainability. The solar array which sits on the roof is helping them become more sustainable and to reach their goals. According to Lindsay Nohl the Southwest Director of NOLS, "the school has a lofty sustainability goal to reach 30% reduction of carbon emissions by 2020." Installing a solar array was an obvious way for them to reduce their carbon footprint and work towards that goal. Apart from photovoltaic or electric solar panels, the school also employs solar hot water collectors to provide hot water to the shower houses on the premises. They also use a variety of rain catchment systems to collect water for irrigation around the school's property. The Montgomery & Associates, a hydrogeology consulting firm, chose to install solar energy to provide electricity for their Tucson office because utilizing renewable energy is important to them and because the investment would ultimately help them save money. The incentives offered by tax credits and TEP also made the investment very attractive. The Montgomery & Associates solar system consists of photovoltaic solar panels resting on a custom-made steel structure. The array also acts as shading for employees’ cars. This particular array has a very high capacity and fits entirely on the parking canopy, which is a great alternative for businesses with restricted roof space. The Tucson Racquet Club is proud to be the new owner of a solar hot water system. As a local Tucson business, the racquet club recognizes their responsibility to be a leader in the environmental arena. Their goal in installing a solar hot water system was to do something positive for the environment, and for their bottom line. They said that they decided to go with the TFS team, because they heard that TFS is the "most knowledgeable solar provider in this area," and "their work is high quality." The Tucson Racquet Club is grateful for the smooth, organized installation process, and the highly efficient materials used to create their new system. They are excited to see their new solar hot water system hard at work. 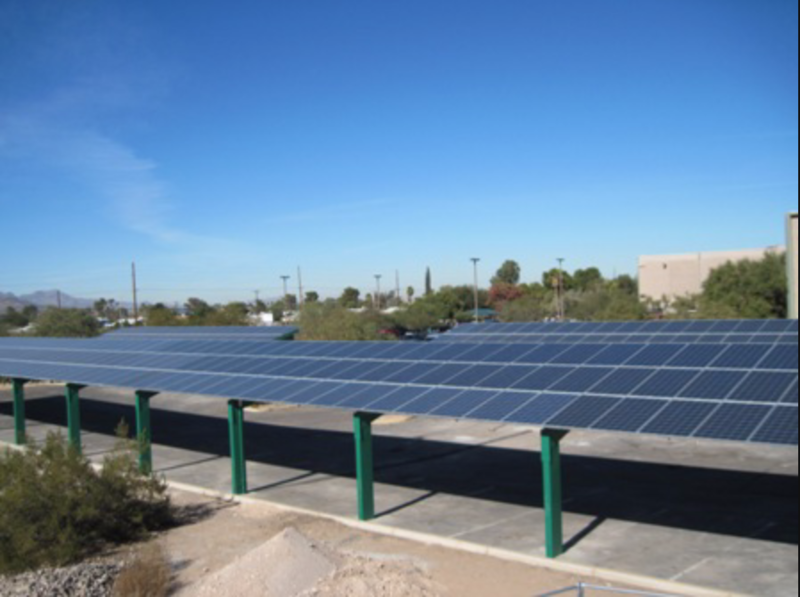 Tucson Racquet Club also uses solar panels to provide the club with clean, renewable electricity, which reduces their electricity bill and their greehouse gas emissions. This West Tucson company decided to install solar because of the cost savings and the environmentally friendly approach to producing electricity. They like their data monitoring system and hope this installation paves the way for the future. They were pleased with their experience with TFS, noting specifically our attention to detail, responsiveness, and customer-focused attitude. Our first recipient in 2009 for TFS’s solar grant was Arts for All, Inc. TFS was proud to install a 5.2 kW photovoltaic system, which is expected to save the organization over $27,000 in utility costs over 25 years. Arts for All, Inc. is a 501(c)(3) non-profit organization that serves children with and without disabilities and adults with disabilities from the greater Tucson area. Their mission is to provide accessible education, training and experience in the arts to children, primarily those with special needs. In an effort to decrease its impact on the environment and become a more earth-friendly facility, Arts for All has taken numerous steps toward general sustainability. For example, to prevent further landfill waste, Arts for All utilizes reused and recycled materials for art projects, implements an organization-wide recycling program, and provides reusable water bottles and tote bags for customers. Arts for All’s sustainability practices stretch beyond the walls of its facility. Native desert landscaping has been planted, requiring low water usage. Also, all employees and members are encouraged to utilize alternative transportation methods such as carpooling, bike riding, taking the bus, etc. For those individuals who are unable to take public transportation, due to disabilities, Arts for All uses its own hybrid vehicle to insure that carpooling is accessible for everyone in their organization. The PV system that was donated by Technicians for Sustainability was not this non-profit’s first experience with solar. Earlier this year, a solar powered parking lot gate was installed in order to support the organization’s priority for long-term sustainability. Lastly, TFS wants to congratulate Arts for All, once again, for the actions they have put forth for energy and resource conservation. We hope you enjoy your new PV system, and continue on your path to a sustainable future. In 2009, Central Animal Hospital designed a new, LEED certified facility to provide a clean, healthful and modern environment for its patients, clients and staff. TFS installed a photovoltaic system and a solar hot water system, which are just a couple of the green features that Central Animal Hospital incorporated into their new building. Some of the other sustainable features include: •Extensive daylighting after taking a mostly windowless building and bringing in natural light via a central light monitor, glass block and solatubes. Haley and Aldrich installed a photovoltaic system as part of their remodeling project in order to follow their own guiding principles to 'lead by example' and 'invest in ourselves for tomorrow' in conjunction with their business segment helping clients implement sustainable practices. They like most the fact that the system integrated well into the property (roof and carport installations without looking gaudy) and they enjoy the ability to monitor system production online in real time.